Day 1 Jaipur/Samode: Morning departure from Jaipur to the charmingly romantic Samode Palace Hotel (approx 1 hour drive), once home to Samode’s ruling family and now meticulously restored to accentuate the wonderful architecture and grand scale. During the afternoon you will embark on a jeep safari around the villages and fields for a glimpse of local life, visiting shrines and bazaars. 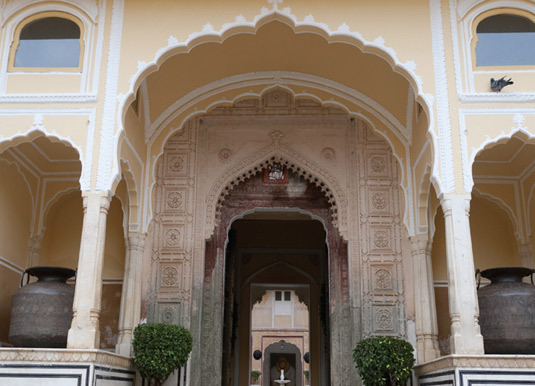 This lovingly restored 475 year old regal mansion enjoys an incredible setting nestled below the magnificent Sheogarh Fortress yet within an hour’s drive of bustling Jaipur. The public areas are a maze of bougainvillea-covered courtyards, terraces and gardens that lead to lounges featuring frescoed walls and stunning mirror work. The seductive rooftop infinity pool is an adult only haven where breathtaking sunsets and views of the Aravalli Hills can be enjoyed, while those travelling with children can splash around in the mosaic pool near the courtyard. The small spa offers massage treatments, there’s a fitness centre and yoga sessions within the grounds along with two restaurants. Deluxe rooms feature rustic décor and comfortable furnishings.